The Kyrgyz Republic, commonly referred to as Kyrgyzstan, has become independent in 31 August 1991. 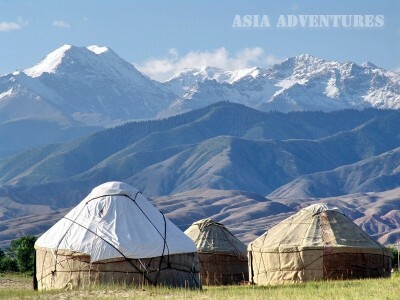 Kyrgyzstan is a landlocked, largely mountainous country of Central Asia bounded on the east by China, on the north by Kazakhstan, on the west by Uzbekistan and on the southwest and south by Tajikistan. 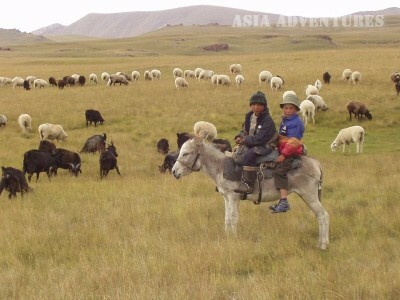 Kyrgyzstan stretches 425 kilometres north to south and 900 kilometres west to east. Kyrgyzstan borders on Uzbekistan, Kazakhstan, China and Tajikistan. Most northern latitude of Kyrgyzstan is 43 o16" (pretty close to the latitude of Rome in Italy) while its most southern latitude is 39 o11", which is the same of Sicily Island in Italy. Kyrgyzstan territory occupies 1,999,000 square meters - more than the territory of Belgium, the Netherlands, Portugal and Switzerland taken together. Country"s total population is approximately 4,700,000 people with Kyrgyz, Russian, and Uzbek being a majority nationalities. In Kyrgyzstan there live for about 80 ethnic groups, some of them like the Tatars, Dunghans, Uighurs and Tajiks making for approximately 1% each of the total population. 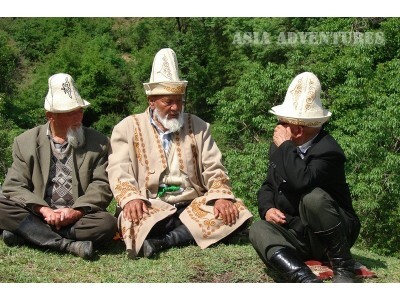 The dominating religion in Kyrgyzstan is Islam. Capital city of Kyrgyzstan is Bishkek. 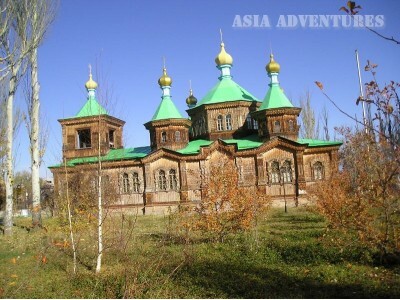 Bishkek is the biggest city of the country and alone represents for about 20% of its total population. 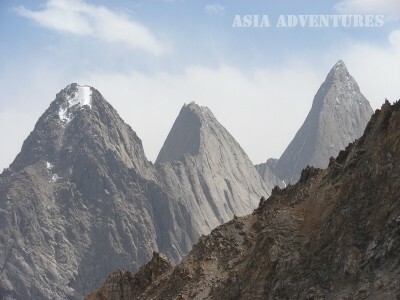 Kyrgyzstan is a mountainous country of which more than 90% is highland at 1000 meters above sea level. 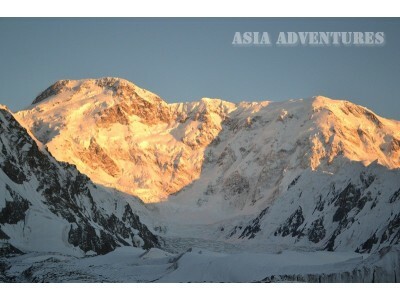 The highest mountain of the country is the Pobeda Peak (meaning "Victory Peak" in Russian), 7439 meters high. 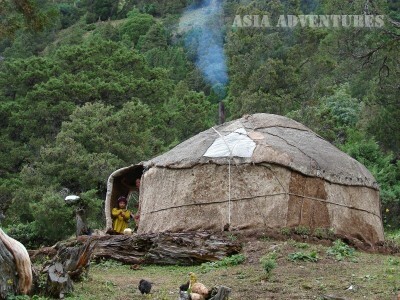 The ultimate low point is located at the western end of Naryn River valley and is about 500 meters above sea level. 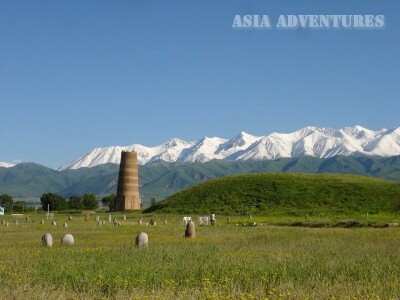 Lying nearly in the middle of the country is the Fergana Valley - a fertile breadbasket area whose boundaries, set by preceding Soviet authorities, are a source of permanent discontent between Kyrgyzstan and Uzbekistan. 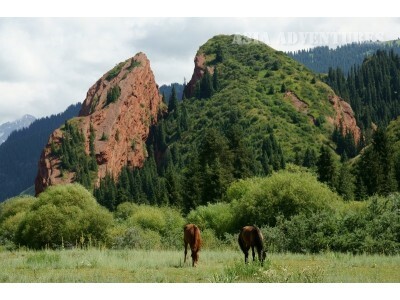 Climate in Kyrgyzstan is extreme continental with long hot summer and moderately cold and short winters. In summer time the areas at the altitude from 800m to 1700m see average air temperature rise up to 26o-30oC while average winter temperatures in the lowlands drop down to (-) 5oC. The country has 1,923 mountain lakes and nearly 40,000 water streams and rivers. However, only 7% of the land is arable, of which 68% is irrigated. Kyrgyzstan"s three major rivers are the Naryn river (also the longest one - 535 kilometres), the Chu River (221 kilometres) and the Chatkal river (205 kilometres long). Issyk-Kul is the largest (6332km2) and deepest (702m) lake of the country. It is never coated with ice to its sufficiently saline water. Two other two major lakes are Song-Kul (275km2, 13.2m deep) and Chatyr-Kul (153.5km2, 16.5m deep) both located in the Naryn Province of Kyrgyzstan. 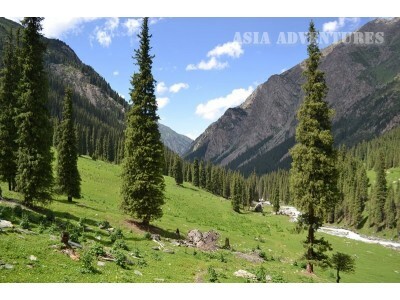 The Sary-Chelek Lake is the one whose turquoise blue water cup surrounded with mountain peaks covered with Tien-Shan spruces are depicted in many tourist posters. 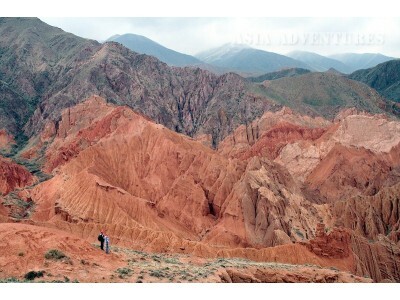 It nestles in the Tien-Shan mountains of the north-western part of Dzhalal-Abad Province. The industrial sector is mainly represented by mining and non-ferrous metallurgy, which are two main contributors to country"s GDP. Gold mining and refining is by far most important kind of activity in the mining sector. 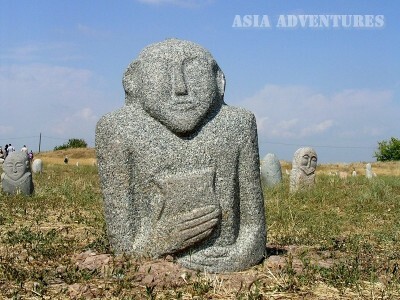 Kyrgyzstan has more than 400 deposits of precious and semi-precious stones. Recently 44 precious stone deposits have also been explored. These deposits include diamonds, sapphires, rubies, emeralds and topaz as well as aquamarine, amethyst, turquoise, rock crystal, nephrite, malachite, jasper and agate. Reserves of brown coal are estimated at 2.9 billion tonnes in four major coal basins. Kyrgyzstan has nearly ideal natural conditions favourable for manufacturing of polycrystalline silicon. The wool-, cotton- and silk industries are represented by a number of large enterprises in the industrial centres, typically employing thousands of workers.